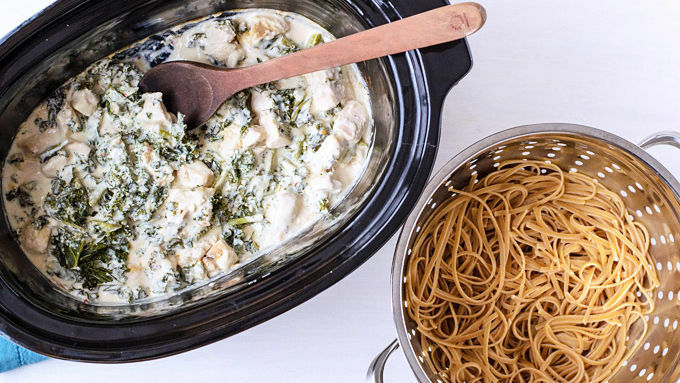 In the bottom of a 4 to 6-quart slow cooker, stir together the chicken pieces, Alfredo sauce, kale, and crushed red pepper flakes. Cover and cook until the chicken is no longer pink in the center, 2 to 3 hours on High or 5 to 6 hours on Low (timing will vary based upon the size and power of your slow cooker). When ready to serve, cook the fettuccini according to package directions. Drain pasta, then stir immediately into the chicken Alfredo mixture. Serve warm, topped with Parmesan cheese. This rich Italian feast is just a slow cooker away. In middle school, dinner at my favorite Italian restaurant was my definition of a dream night on the town: unlimited bread, the potential to catch “Happy Birthday” sung opera-style, and best of all, a giant dish of chicken Alfredo all to myself. It was anything and everything my 11-year-old self could wish for in life. 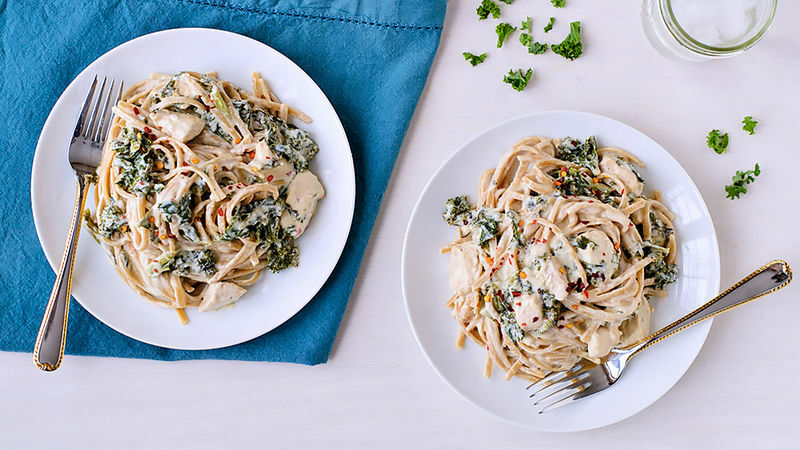 Although I haven’t been back to that Italian restaurant in years, my inner kid can still relish the satisfaction of my own personal plate of creamy, decadent chicken Alfredo, thanks to today’s easy slow cooker version! I used jarred Alfredo sauce to keep things super quick and easy. Chopped kale provides some much needed green (an addition my pre-teen self would not have appreciated, but my more sensible grown-up sides recognizes as important for at any dinner, even an indulgent one) and a pinch of crushed red pepper flakes kicks up the flavor. Feel free to add more or less to suit your taste. Making this dish could not be easier. Simply stir the sauce, chicken, kale and red pepper together in the slow cooker, cover, and press go. No precooking of any ingredient is needed. 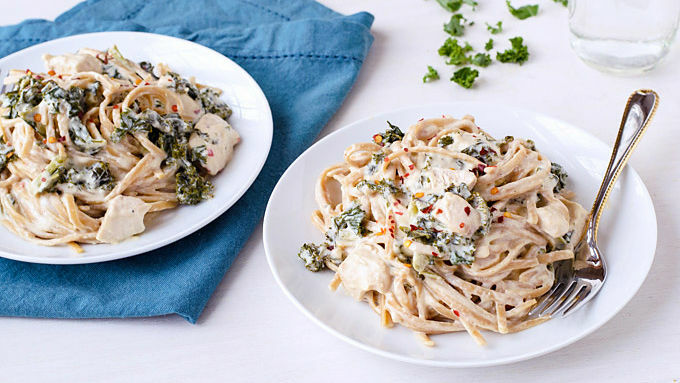 The Alfredo sauce makes the chicken flavorful and juicy, and the kale becomes tender as the meal cooks. When you're ready to serve, boil up a pot of pasta, stir the noodles right into the slow cooker along with the sauce, and voila! A fine Italian feast delivered to your table. Opera singing is optional but encouraged.